Of course, one of the reasons the Sports Direct till queue moves so slowly is the staff are trying to sell their catalogue for 50p to everyone. When I got to the front of the queue my till assistant asked me if I wanted a catalogue. I said no and she carried on trying to sell me a catalogue. I had to say no again. They must bonus the sales. I thought the interesting thing was a great big banner over the tills asking for comments about the queue and any delays. 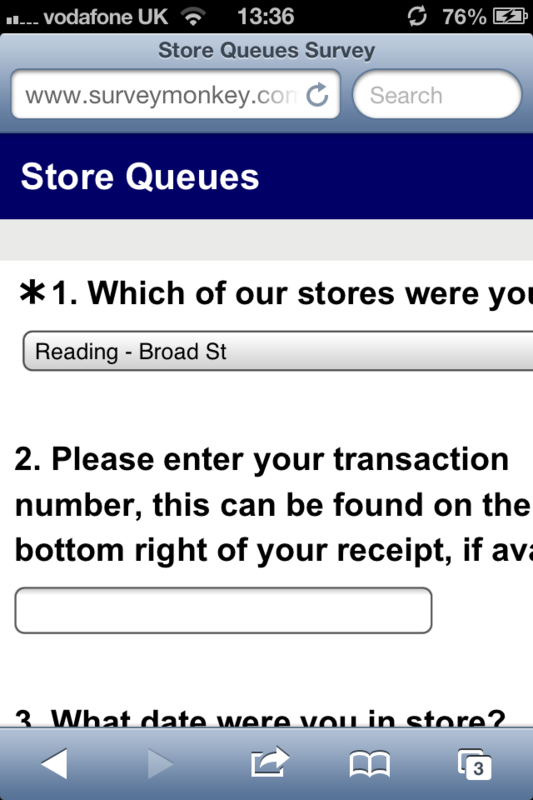 They even have a link www.sportsdirect.com/queue to a Survey Monkey survey page. And no, I wasn’t offered a bag for life, a question on the survey. Perhaps saving the planet isn’t part of the bonus scheme. i would like a sport direct catalogue.